Give your outdoor shrubs an added level of dimension by planting them in decorative pots and planters. Planters assist in setting the style for your patio. 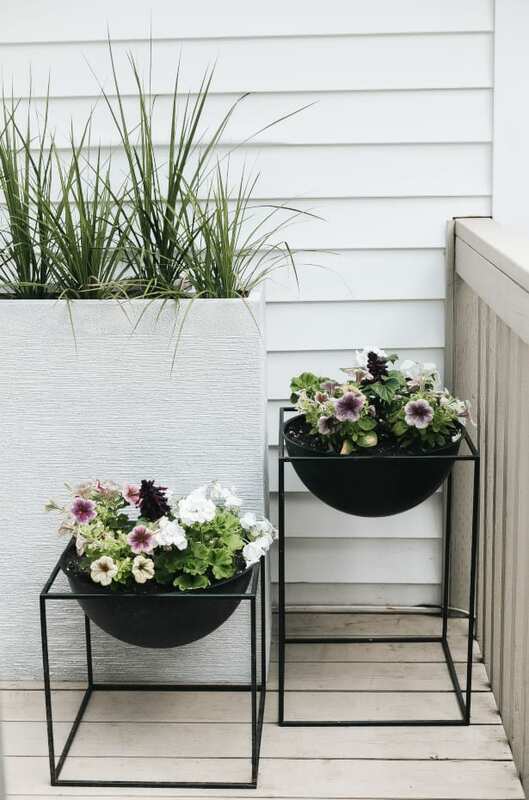 Whether you decide to replicate your home’s interior decor on your deck or differentiate the outdoor space with a distinct style, you can use outdoor planters to amplify the look. 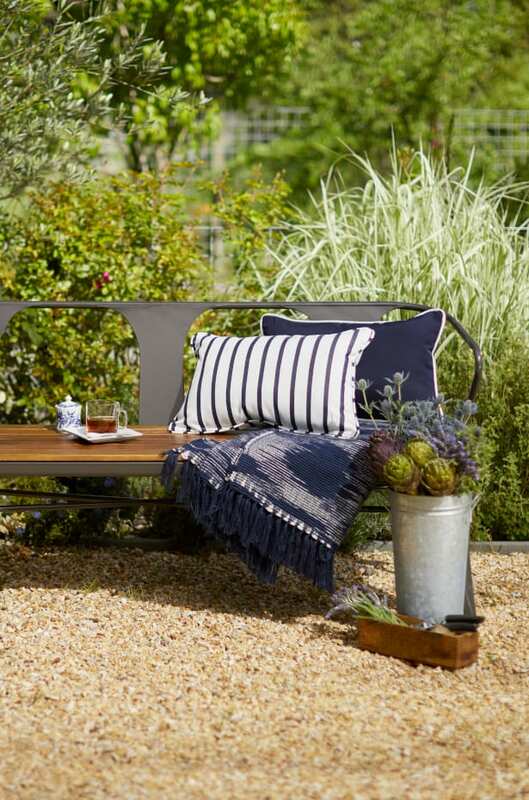 Read our guide on Patio Decorating Ideas for more tips on styling your patio. For a look that never goes out of style, set out ornate urns and classic planters that highlight traditional decor. Urns are an outdoor planter staple that have their place primarily in traditionally styled patio designs. Color, style, and carved detail can be personalized to your taste. A non-negotiable aspect of traditional decorating is the element of symmetry. Align matching urns in pairs, flanking a patio door, surrounding the top of the stairs, or bordering a walkway. The urn’s material determines the weight. Go with something lighter like plastic or fiberglass if you anticipate wanting to rearrange them. 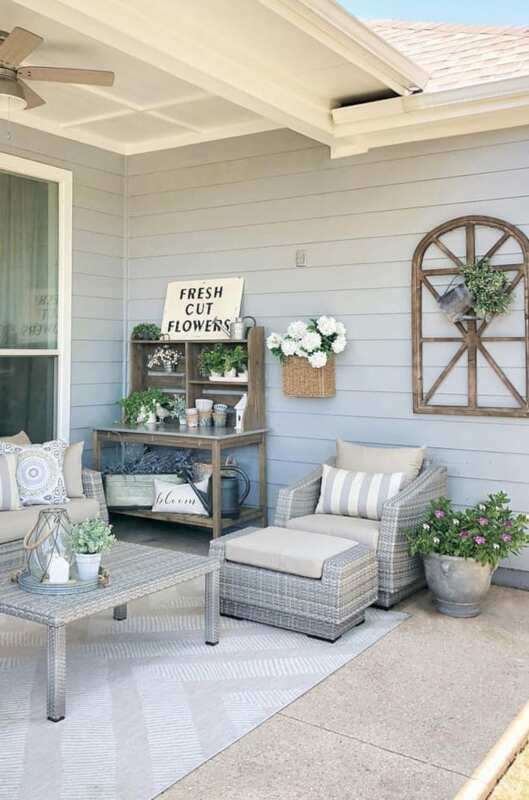 Accentuate the casual charm of your farmhouse-style patio with colorful blossoms and wide-leafed shrubs housed in galvanized metal and whitewashed wooden planters. 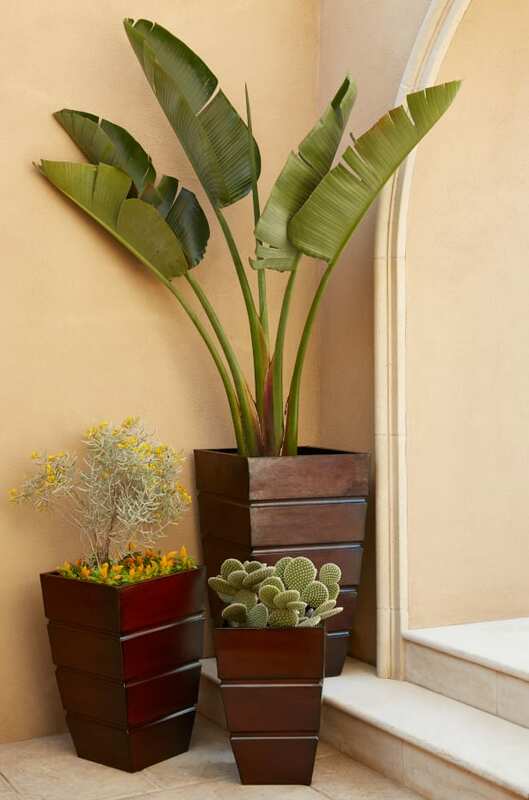 Groupings of oversized pots, graduated in size, create a relaxed, eye-catching arrangement. Situate them in bland spaces, like an empty corner or at the base of deck stairs to add visual interest. When decorating with heavy, oversized pots, you’ll want to find them a permanent home and erase the need for mobility. You can make your own farmhouse-style hanging planter: Watch our DIY Outdoor Decor tutorial for the details. Accent the evocative aspect of mid-century modern design with planters that embody the style. Standing planters with thin, tapered legs match the legs in many mid-century modern furniture pieces, like chairs and tables. Look for shiny metallic pots or those in structured geometric shapes to epitomize the style’s aesthetic. Understated plants and shrubs are the ideal choice to fill your metallic planters; they give the right amount of life and texture to the patio without overpowering the space. These planters look just as good grouped together as they do standing alone. Use them to fill out the decor in a seating area or to place some greenery near the side of your pool. Use planters in your outdoor industrial design to infuse life into a style that is primarily monochromatic and minimalistic. Customarily the material of choice in industrial design, metal lends itself to durable pots and hanging planters that look perfect on a patio. 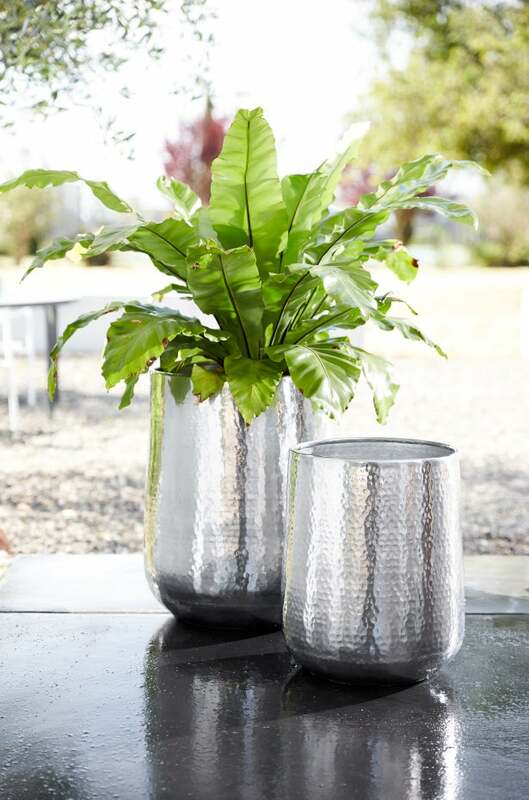 Include factory-inspired metal planters within your garden for a surprising pop of industrial style. You can add color to the neutral decor in shades of green from potted shrubs and trees. Plants with large, wide leaves or long, draping blades provide ample color with the alluring accent of full foliage. Take care to ensure that your metal pots are made for the outdoors so they’ll be durable in all types of weather. As you look for minimalistic planters that embody contemporary style, choose simple containers that place focus on the plants. Sleek square-shaped pots in a simple design help achieve the look. Situate them in a garden to add levels and dimension, or arrange them on your deck to add color and life. Large, dramatic plants that stand upright help exemplify the contemporary design. Choose potted shrubs, like palms, flaxes, or agaves, or try trimmed topiaries that portray a tidy appearance and structural form. When decorating in glam style, metallic finishes are a must. There are plenty of places to incorporate them on a glam patio, but they look especially luxurious as vases, pots, and hanging planters. Glam design is defined by extravagant accessories placed intentionally for optimal visual impact. Hang geometric-shaped gold planters on eaves across from the seating area on your patio to create a natural place for eyes to rest. 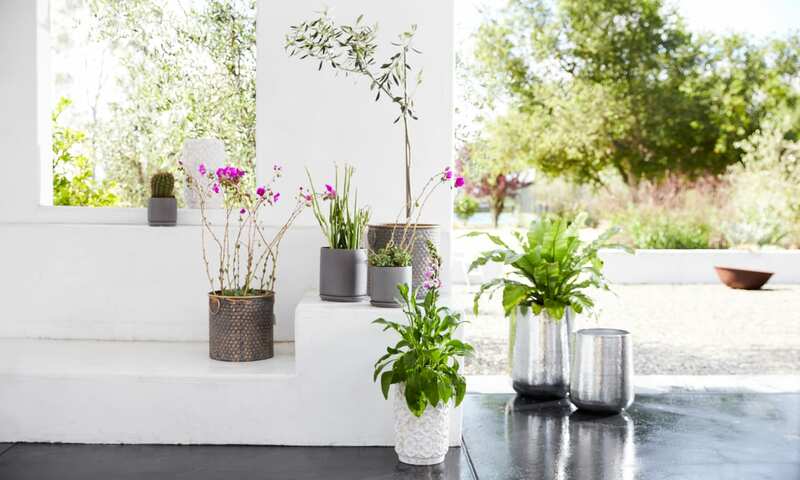 You can use metallic planter stands in place of side tables and place small pots of seasonal blossoms on the tops. While plants and flowers are the reason for the planters, the containers themselves should make a statement. Modest plants and dwarf shrubs are unassuming options that make way for the planters to shine.